Every Wednesday I settle down to watch to the tantalising and titillating delights of The Great British Bake Off. Mary Berry’s Jam and Jerusalem (with whiff of sherry) and Paul Hollywood’s piercing eyes (and tongue) it’s become somewhat a guilty pleasure of mine. So this weekend I decided, enough was enough, I was going to get my bake on! After two hours of melting, mixing and generally making a mess I managed to conjure up these little beauties. I must say, they were far nicer than I thought they would be given that baking is somewhat a technical task for me with all the measuring and temperatures. Sometimes it can feel more of a science experiment than an indulgent pastime. These are definitely worth the work if you have a couple of hours spare on a Sunday afternoon… enjoy. Preheat the oven to 170°C (325°F), Gas mark 3. First, make the salted caramel sauce. Place the sugar in a saucepan on a medium heat. Allow to heat up. As it gets quite hot you’ll notice the sugar melting and starting to caramelise around the sides of the saucepan. Swirl or gently shake the pan every so often until all the sugar turns a deep golden brown and is smooth and glossy. You might need to stir it a little bit with a wooden spoon to bash out any sugary lumps. Stir in the butter and the cream and keep stirring until it is smooth again – it might take a minute or so. Add in the salt and remove from the heat. Next, make the cupcakes. Place 12 paper cases in a cupcake/muffin tray. Sift the flour, cornflour and baking powder into a bowl, then mix in the sugar and salt. Rub in the butter. Place the milk, vanilla and eggs in a separate bowl and whisk to mix. Pour into the dry ingredients and bring together with a wooden spoon. Fill each paper case about two-thirds or three-quarters full, then bake in the oven for about 20-25 minutes until cooked in the centre. There should be a light spring when you gently press the centres with your finger. Take out of the oven and allow the cupcakes to cool. While the cupcakes are cooling, make the salted caramel buttercream icing. 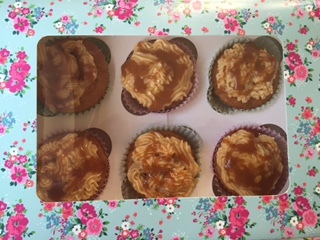 Place all the ingredients in a mixing bowl with 175g (6oz) of the salted caramel sauce (reserving any remaining sauce for later) and beat to mix together for 10-20 seconds until light and fluffy. Set aside. 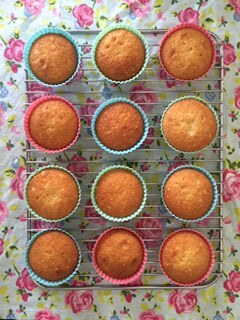 When the cupcakes have cooled, using a small, sharp knife, cut a piece out of the centre of each cupcake, measuring about 1-2cm (1/2-3/4in) in size. Discard (or eat!) the cut-out bits of cake, then fill the ‘holes’ with some of the reserved salted caramel sauce. Place the salted caramel buttercream icing in the piping bag and pipe in a swirl over each cupcake. 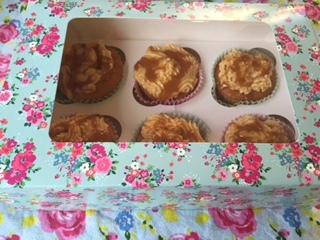 Drizzle any remaining salted caramel sauce over each iced cupcake to decorate.